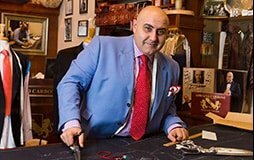 Adriano Carbone Master Tailor would like to welcome everyone in Melbourne, Australia and indeed the world to the fine art of tailoring at it’s highest level, in the Block Arcade. With over 40 years of experience coupled with a passion for tailoring, Adriano warmly invites you to visit and discuss your new garment and tailoring needs. Each garment is individually designed and created with the most intense and meticulous hand crafted process and manner. Our point of difference is that we make the garment from start to finish, right here in our Melbourne Sartoria, warmly located within the glorious surrounds of the Block Arcade. The fabrics used are sourced from the finest houses in Italy and England with a strict quality performance, intact. Our business has the capacity, diversity and experience to accommodate any range of master tailoring as testament to our work ranging from military uniforms, to wardrobes for major musicals. You even have the choice to observe Adriano whilst he personally hand crafts your garment, with the assistance of his lovely wife and business partner, Maria. With all this in mind, we want to share our expertise and passion for tailored suits and garments with the world. The staff at Adriano Carbone Master Tailor are skilled and advanced to provide the support and customisation, you need for a new garment. With a cross section of experience and indeed quality customer support, we now introduce you below to the key members of our business. Come in and personally meet Adriano and he welcomes any enquiries as the essence of his approach, is communication and translation. This basically is where, when and how Adriano begins to properly assess your standards, whilst extracting a knowledge base and customisation platform, for each individual client. Bespoke is the key work Adriano does here as he has a high level of understanding required to ensure complete awareness and satisfaction, with the perfect end result. Maria has a passion for the art of bespoke tailoring and private enterprise given her strong retail background. She is a committee member of the Collins Street Precinct, the organisation that assists businesses and one of its key members, the Block Arcade. She has worked alongside her father, renowned furniture salesman, Franco Cozzo, and is now the business partner of her husband, Master Tailor Adriano Carbone. Maria was born with a special gift as a singer and entertainer. She produced and performed her own concert, Mina il Musical, at Hamer Hall in 2013, as a tribute to Italian iconic singer Mina. Maria is passionate about preserving the old-fashioned art of bespoke tailoring and espousing the value of hand-crafted garments that are proudly Australian-made.